The ancestor of the Nims family in America, Godfrey Nims, arrived in Deerfield around 1667. 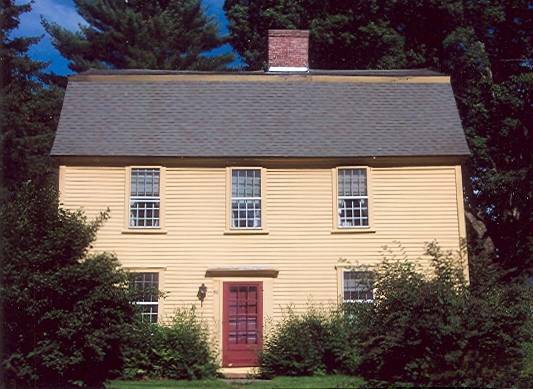 He constructed this home around 1685. The home burned in 1694 and Godfrey rebuilt it. Again, it burned in the 1704 Indian raid and was rebuilt in 1710 by John and Elizabeth (Hull) Nims, who both had been Indian captives. The house served as a post office from 1816-1831. The property went out of the family in the 1890’s but was bought by two Nims descendants, Eugene D. Nims and Harry D. Nims, in 1936, who deeded it as a gift to Deerfield Academy in 1938. The house is used as a faculty residence.